At a recent client, I had a "citizen integrator" ask me to show them some of the orchestrations that I’ve created in ICS, and how I went about creating them. I began showing off some of the integrations, and some of the POCs that I created. I didn’t get very far until he stopped me and asked, how I was able to invoke the integrations to test them. This is when I realized he had previously attempted to create some integrations, but didn’t understand what he created, or how to trigger them and see them in action. 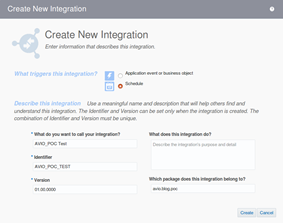 How do I test my integration on Oracle Integration Cloud Service (ICS)? So, let’s take a common scenario, where you are asked to verify that an integration works from ICS or as a developer you want to explore a new integration you are going to interact with. We are going to look at the most common type of integrations, ‘Orchestration’. Oracle has this all documented here, so feel free to jump there for more thorough documentation! On creating a new Orchestration integration, the first decision is ‘What triggers this integration?’. There are two options, ‘Schedule’ and ‘Application event or business object’… So what are these, and what should I choose. Let’s start with Scheduled, as this is the quickest option to ‘try out’ an integration or mapping. Creating a ‘Scheduled’ orchestration is meant for exactly as it sounds, a schedule. You can define it to run every minute, every hour, every Monday, whatever the requirement is… The bonus feature about this option is the ‘Submit Now’ selection. This makes it very easy to test! Now, let’s create a new Orchestration, and select ‘Scheduled’ (make sure you follow best practices and add it to a package!). Read the complete article here.